Bellevue Literary Press, 9781934137123, 191pp. Paul Harding's Pulitzer Prize-winning and New York Times-bestselling debut novel about memory, consciousness, and our place in the natural world. An old man lies dying. Confined to bed in his living room, he sees the walls around him begin to collapse, the windows come loose from their sashes, and the ceiling plaster fall off in great chunks, showering him with a lifetime of debris: newspaper clippings, old photographs, wool jackets, rusty tools, and the mangled brass works of antique clocks. Soon, the clouds from the sky above plummet down on top of him, followed by the stars, till the black night covers him like a shroud. He is hallucinating, in death throes from cancer and kidney failure. A methodical repairer of clocks, he is now finally released from the usual constraints of time and memory to rejoin his father, an epileptic, itinerant peddler, whom he had lost seven decades before. In his return to the wonder and pain of his impoverished childhood in the backwoods of Maine, he recovers a natural world that is at once indifferent to man and inseparable from him, menacing and awe inspiring. 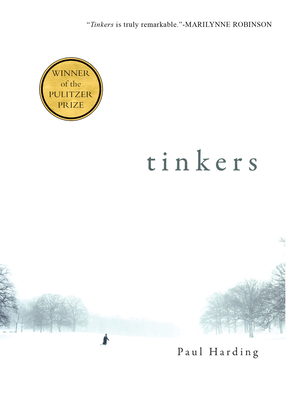 Tinkers is about the legacy of consciousness and the porousness of identity from one generation to the next. At once heartbreaking and life affirming, it is an elegiac meditation on love, loss, and the fierce beauty of nature.